Firefighters worked at the scene of the collapse on Tuesday. QUINCY — Demolition of the historic Wollaston Theatre was almost complete when the last remaining wall collapsed Tuesday, injuring two workers. It was the type of calamity the Quincy Fire Department had been fearing when the project began, said Deputy Fire Chief Jack Cadegan. The walls of the Beale Street landmark had probably been weakened over the years by water damage, he said. The building is about a century old. Demolition began about three weeks ago, he said, and was almost complete when “something gave way” and the 15- to 20-foot wall collapsed at around 3:15 p.m.
A 38-year-old man was working in a bucket truck when the wall went down and was able to jump out, avoiding serious injury but sustaining lacerations to his arms and face, Cadegan said. 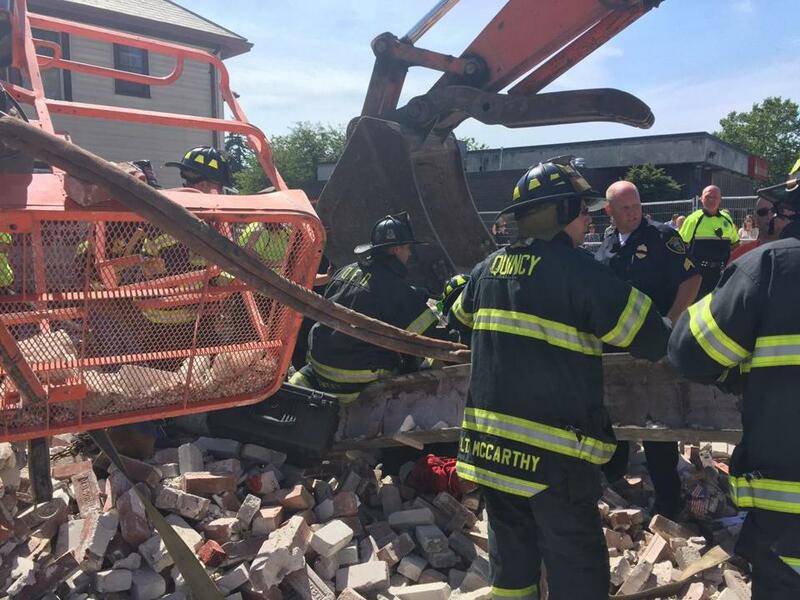 The second worker, a 40-year-old man, was buried chest deep in about four feet of rubble, with an 18-inch steel beam across his chest, Cadegan said. The man remained conscious throughout the rescue. Authorities did not relate the extent of his injuries. Both were taken to Boston Medical Center, responders said. Quincy resident Dave Bishop was about to enter a Dunkin’ Donuts adjacent to the site when the wall collapsed, and he ran up to the fencing around the construction to get a better view. “I saw dust more than anything,” Bishop said. But when the air cleared, he said, he could make out the buried worker. The man, he said, had a bloodied face. Though he looked seriously injured, he did not cry for help. Bishop watched as rescuers pulled the man from the wreckage, and said the worker couldn’t straighten his legs. The deputy chief said the Fire Department was on scene three minutes after it got the call and had the man pulled out of the rubble five minutes later. Because the project was nearly complete, all utilities had been deactivated, which is likely to have prevented a more serious disaster, Cadegan said. Reis Thebault can be reached at reis.thebault@globe.com. Follow him on Twitter at@reisthebault.